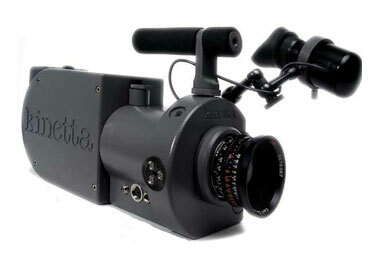 The Kinetta is a digital cinema camera that records 1080p images at any frame rate up to 60 fps. One of the coolest features about this camera is the hand-crank attachment, it allows you to vary the frame rate based on the cranking speed. The video is recorded onto a removable cartridge that holds an array of 12 small laptop drives and can record up to 110 minutes of 24fps video. This isn’t a camera you’ll likely take on the next family vacation because it’s about the size of a small 16mm film camera. You can’t really buy one today, unless you really, really want one… then expect to pay about $60,000. Check out the Kinetta website for more info!